The Club runs an Agility/Jumping program for all club members, regardless of whether you plan to compete or not. Agility and Jumping involves the dog running at speed around a set course of obstacles. The event is timed and in order to pass, your dog must not make any errors. The fastest, clear dog, wins. It is a team event, the team being you and your dog. This activity is for the person that loves dog training and is looking for a fun activity/game to do together. It involves running for both the handler and dog. It is a light hearted sport, but very challenging. As equipment is involved, after you master the foundation skills, you will find that you will end up wanting to have a couple of jumps and a set of weave poles at home for training purposes. These can be made for minimal financial outlay. The training method is 100% positive reinforcement. There are no corrections given. We make use of Clicker when appropriate, use lots very high value food treats and a wide variety of toys. We recommend you complete the 8 week beginner obedience program so that you understand the basics of how a dog learns. A fit, trim and healthy dog that is not aggressive to other dogs. A variety of toys that your dog loves. If your dog is not very toy motivated, then a toy that you can put food inside and throw. A flat collar and standard leash. A crate, or safe peg to tie your dog to. Don’t worry if your dog is not great at Staying or Coming when called. These foundation skills plus more are all taught as part of the agility program. We will accept puppies 8 months or older, but they will not be able to start jumping until they are 12 months old (depending on the breed). WHAT TO EXPECT WHEN YOU COME ALONG. We will do a temperament test to ensure your dog is going to get along ok with the other dogs. We have to take this precaution, because Agility is an off leash sport. Initially the lessons will focus on your dog finding joy for staying, coming when called, and chasing you around on either your right or left hand side. You will also be shown how to teach your dog tricks using shaping. We will evaluate what is the best reward system for your dog. You will be taught how to reinforce your dog for the behaviours you want. We will then add in building value for jumping obstacles and running through tunnels causing your dog to find joy in doing these activities. You will be taught the Greg Derret handling system and we will start to run small sequences of obstacles focusing on different handling manoeuvres. 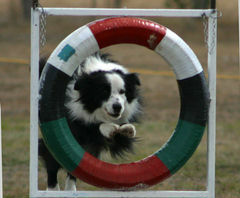 If you are interested in doing Agility, please speak to any Club instructor.